You can bring your pet, because many of our routes allow it. Seville, our beloved and beautiful city had been several times the best sets to shot many films and series on the national and also international level. Besides of also had been the set from different genres, from Star Wars to “Allí abajo”, a successful national series that talks about the differences between the north and the south sides in the country. STAR WARS (2002): Here was shot the Second Episode – The Clones attack by George Lucas, featured by Ewan McGregor, Hayden Christensen, Natalie Portman and Samuel L. Jackson among others. We can see to Amidala Queen walking with the young Darth Vader and his fellow R2D2. 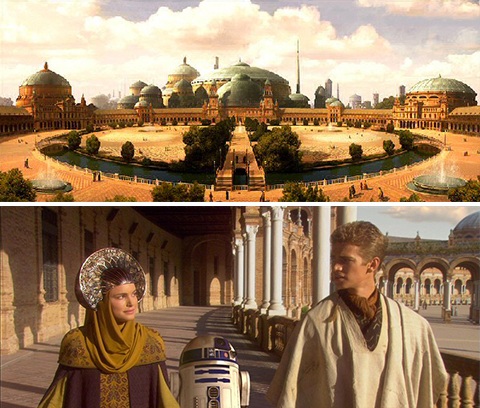 They are in Naboo planet that is actually Plaza de España ubicated inside of the Maria Luisa Park, built by the sevillian architect Aníbal González to the celebrate the Iberoamerican Exhibition in 1929. Maybe the same reasons that motivate the producers to film here are today the reasons which motivate to this impressive monument to be the most beautiful in the world. DAY AND KNIGHT (2010): Filmed by James Mangold and featured by Tom Cruise and Cameron Diaz. In this film appear many Seville places. For example: The Virgen de los Reyes Square, la Maestranza (The Bullring), the “Plaza Nueva” and the Santa Justa train station. Also they filmed in a hidden secret square near to the Giralda tower: Santa Marta square. In the film Seville is the Sanfermin festivity city and appears Seville and Cádiz streets mixed (when the real city is Pamplona, Navarra). The film director hadn’t very clear the festivities location in Spain, for sure. He think Spain is everything the same. LAWRENCE OF ARABIA (1962): The film showed the fantastic life of Thomas Edward Lawrence a full life of adventures in the Arab desert. The Royal Alcazar is where the director get inspired above all the scenes when Lawrence of Arabia arrives to Jerusalén. The “Casa Pilatos” palace: In this renaissance – mudejar style palace between the columns met Lawrence of Arabia and the general commandant. Plaza de España in the film was a club in El Cairo where the soldiers came to meet and the Maria Luisa Park with its exotic style and beautiful fountains, colorful flowers and architectonic elements from Islam. All this elements made it in the perfect place to reproduce the Damasco and Jerusalen ambient, especially on Plaza de America surroundings. 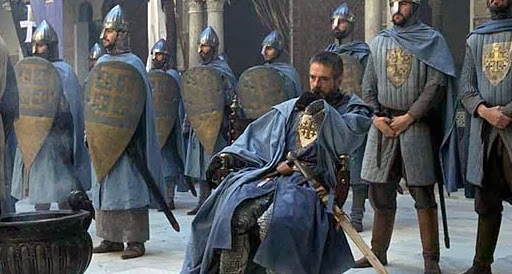 THE KINGDOM OF HEAVEN (2005): Ridley Scott was the director who came again to shoot in Seville after the “1492: the paradise Conquer” movie shot in 1992. This new film is a medieval adventure developed in the Crusades period. Scott took the same settings: The Royal Alcazar and the Casa Pilatos palace, converting it in a Jerusalén palace from the 12th century. Casa Pilatos palace was decorated with furniture and carpets in the same style than in this period. All it was the roman magistrate house in Jerusalén. GAME OF THRONES (2014 y 2015): This worldwide known series have chose many times Seville as setting to film several scenes in different seasons. 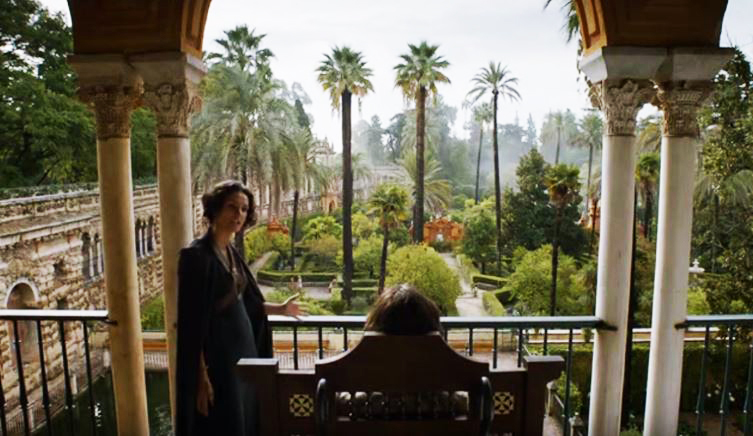 First of all they shot inside of the Royal Alcazares of Seville to recreate the Dorne Kingdom (October 2014) that was almost all done in Seville was the perfect setting for Dorne. In the Osuna Bullring was recreate the Daznak Pit in Meereen, in the same date when Dorne Kingdom was filmed. While Daenerys is in a gladiator fight she’s victim of an ambush by the Harpy Sons. She runs away from here because one of her dragons came to save her. This scene was one of the most ambitious in all the GOT production by the technical means and extras it supposed. On November 2016 they came back to film inside of the “Atarazanas” (a 13th century building used to store boats) and was converted into a Dragon Dungeon in Kings Landing’s Red Keep. 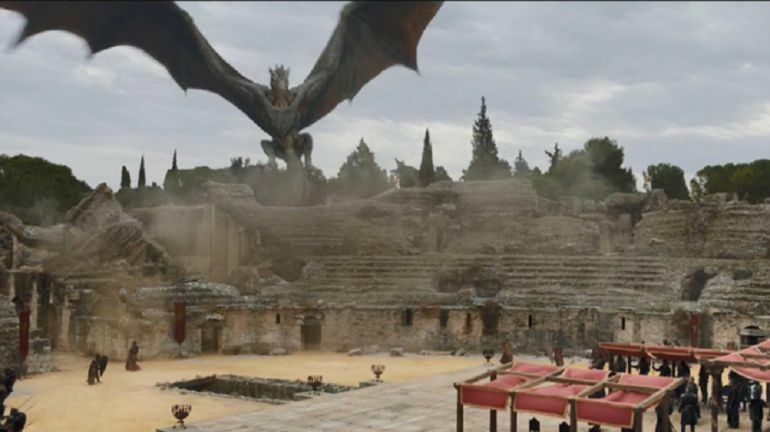 They also shot in Itálica, an Archeological Roman Site in Santiponce, where was recreate Dragon Pit, where the Targaryen keep the dragons until the extinction, in Kings Landing. In Itálica was the biggest principal characters meeting in this TV show. There Daenerys showed to Cercei where was the real War, showing her the white walker. Then here appears Jhon Snow, Daenerys Targaryen and Cercei Lannister. As you can see Seville and Game of Thrones have many things to told about the series… above all because this spring the actors came back to shoot some scenes of the 8 season. If you want to know more about how GOT team lived in Seville, Osuna and Itálica during the shooting days, you can book with us the tour Game of Thrones in the Álcazar. Now you already check that are many the films have been shot in our monumental city to give the ambient the film producers were looking for… If you want to live you holidays as a film don’t hesitate in visit Seville! A visit to La Isla de La Cartuja: worth it? TOP 10: Books with Seville as scenario.